The name Turquoise is came from “Turkish Stone” as it came to Europe from Turkey over ancient trade routes. Turquoise was one of the first gemstones known to be found by man. Ancient records show Turquoise was originally discovered on the Sinai Peninsula of Egypt around 6,000 B.C. Deposits of Turquoise are found in Iran, China, Australia, Israel and the southwest United States. Turquoise is formed when Hydrated Copper and Aluminum Phosphates are present in the earth along with the perfect soil and atmospheric conditions. There are many color variations from sky blue to rich green that are caused by different mineral elements being present such as iron, calcium, magnesium, manganese, zinc, chalcasiderite and faustite. Copper is one of the most important minerals in Turquoise and the mineral that makes Turquoise blue. Different forms of iron content forms the green variations in Turquoise. Turquoise is found in many formations such as nuggets which are old voids in the earth, cracks in hard rock which is called vein Turquoise and because Turquoise is formed from water solutions, it can take the shape of different types of voids in the earth such as plant roots, ancient sea shells and so on. 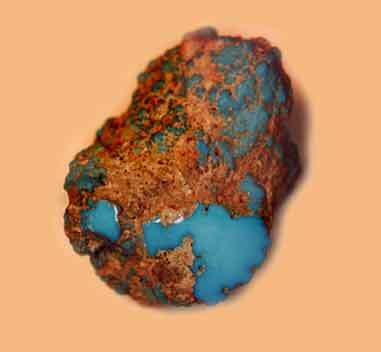 The hardness of Turquoise varies from a 2 to a 6 on the Mohs hardness scale.